This coming weekend I’ll be at SPACE in Columbus, Ohio. Next weekend I’ll be at MoCCA Festival in New York City. See you there! This is super cool comic. Liked the concept very much. I meant: I am not that sad about this because the people on G+ are a lot better then then the people on FB. 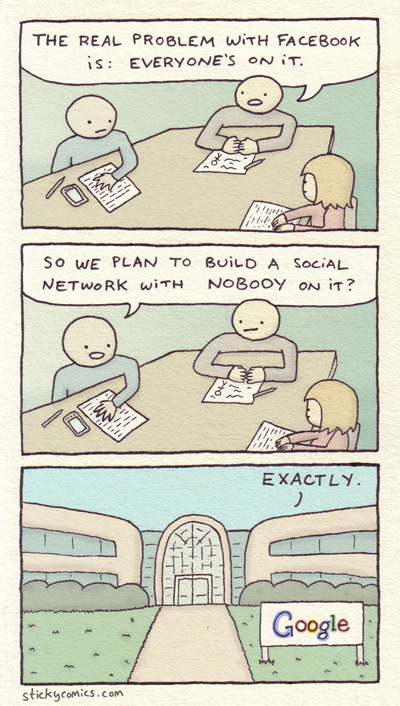 LOL, I do use Google Plus but it pales in comparison to the popularity of facebook. And then in January 2013, Google+ surpasses Twitter in number of users, and is now the #2 social network on the rise, while Facebook is crippling itself and falling. It’s fun reading these comics and the comments at the time. G+ was trying to be like facebook, and they succeeded. problem was, people were already on facebook, so why switch? G+ didn’t have enough new features to attract people. The problem with G+ is that it’s a failure, and Googles approach to address that failure is to ban you from Youtube, or ban you from making Playstore reviews unless you agree to have a G+ account. First: It is a brilliant JOKE!!! Second: People having a massive row over where should people “hang around” like they were actually doing it… YOU ARE PATHETIC!!! Shut your bleeding computer and go out to the cinema or the coffee with your friends, you know like you just to do it in 1999!